ok, SS is now variable using Square D octal timer delay relay driving PB open frame relays for HV on/off and step start resistor engage/disengage. Inexpensive and look robust. I have to run 120V coils however, since I do not have 24V in the HV unit. Schematic getting a bit busy in that part of the sheet. I think this unit is now going to be separate from the rest so I can move it around to future transmitters and move it if I want to run the L4B. I am re-thinking the full 6ft rack. I may go to a half rack that holds the controller, RF Deck and Modulator. Still trying to decide. I don't have a lot of space in the basement so ease of moving is important. Stuffing the PS components in the bottom of the Motorola rack (if I get it) will make it very cramped and not very serviceable. That transformer and choke are HUGE. Thinking of a roll-about wooden platform with a removable interlocking metal cover that makes it easy to expose and work on the PS unit (power off of course). Kind of like a mover's dolly with a metal cage around it. I can then roll it under my tables to get it out of the way. Trying to think of a indicator that will illuminate as long as there is potential on the caps. Or I will just mount a second meter on the HV unit. I want a visual indication of it being dead. Otherwise when I open the unit I will kill an interlock switch in the process. Sounds good on the step start. For relays: I would recommend staying with 24 VDC coils only - for all station switching. They are generally quieter and safer than 120VAC coils. I also have 12VDC available for T/R keying since it is sometimes needed too. BTW, there are lots of cheap 24VDC small switching power supplies on eBAy, etc. I use a few here for 24VDC and 12 VDC. Ya never know when you will need another relay as you add equipment. Basically I have a 24 VDC T/R keyed wire, running to all rigs. When a rig's panel T/R switch is on, that rig gets keyed and switches its antenna relay, mod and RF PA on, etc. Simple. plus the skill to tailor the audio processing & EQing to best highlight our unique voices!" Here is an inrush circuit that should handle the inrush current for initial charging. It is a modification of the one that I use on my Henry 2k-4. On edit - think I will slap a 2200uF cap across the surge relay coil and not put in the delay relay for now. That should give me around 3/4 of a sec of delay which should be a good starting point. I will make space for the third relay if I need to mess with the TC. Relays are here, going to start construction. Tom’s tubes are here as well! The Collins KWS1 uses a leave spring that shorts the HV as soon as the top plate is removed. Very simple and safe system. If someone has a KWS1, he can make a pic of it. So does the Heath SB220/221. Unfortunately, some have, without thinking, removed the cover with the HV on which usually ends up with some destruction of some HV components. Seems to me there should also be an interlock that would remove the primary to the HV xvmr along with the shorting leaf. No. No fuse will act fast enough to protect the HV components. PS: Forgot to mention that a "glitch fuse" works fast enough. W2DTC has some nice detail on this. Usually made of #30 wire but the Clipperton L uses a pair of carbon comp resistors that works well plus provides an interesting light show should they be violated. 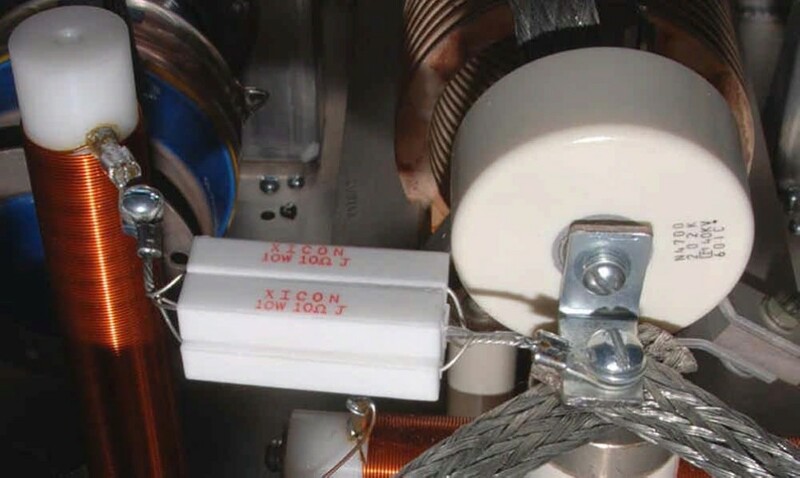 If you place a cap across the relay coil, it not only delays the contacts making contact, but it will also hold the relay in for a while and delay the contacts breaking when you go back to receive. To avoid this, you might want to add a diode in series with the capacitor, charging it while going from receive to transmit to delay the contact closure, but also allowing the contacts to close immediately without the capacitor holding the relay closed. I used an extra set of contacts in my sequencer to discharge the capacitor through a resistor when the relay opens, such that the delay function is preserved the next time the relay is energized. Yep, I was thinking the same thing, Rick, but forgot to comment on it. Before I went with all adjustable delay relays for the sequencer controls, I tried the capacitor/resistor/diode circuit. It worked OK, but it took some messing with to get it perfect. I've found as you change things and want different timing responses in the shack, the timer relays are a cinch to make things right with a turn of the knob. Somewhat elaborate I admit, but with mine, I can independently adjust the attack and release times and keying order - which helped to fine tune my arcing T/R problems with the 4X1 rig. It also controls HV step start, antennas, mod deck, RF keying, audio, mod reactor quenching, etc. There is a sweet spot in adjustments where the transmitter keys and operates smoothly and near perfect..
FB on the adjustable delay relays, Tom. That certainly is a convenient way to fine-tune the sweet spot. I designed an RC time constant sequencer, amplified by a few cheap NPN transistors to drive the relays, thus taking the relay coil variations out of the equation. I put these on a perf-board under the chassis in my Viking II and Valiant. Currently I am finishing up the software to do all sequencing with an Arduino Nano ($3) and a relay module with eight optically-isolated SPDT relays ($6) and a 4-line 20-character LCD display ($5) with a couple buttons to configure the desired options. This allows me to keep several transmitters attached and select the desired combination via a simple menu. The buttons were two for a buck and the entire shebang is powered by a 5-volt micro-USB cellphone charger. Can't get much cheaper than that! Don't want to hijack John's 813 thread, but knowing he is a software jock, this idea might interest him as well. Real simple to code in C with the Arduino IDE. Cheaper and simpler than a bunch of RC circuits! There are 2 issues at play here and I am only trying to solve one now. I understand the need for overall sequencing (Fabio II was very illustrating) and the strong desire to have it quite flexible. The primary engineering issue at hand here is how to safely handle the inrush current on this very large supply properly so that every time I activate it the diodes are protected while those large caps charge. I think this needs to be a fixed TC and absolutely independent of overall sequencing or I will risk PS components and safety. I can't let a mistake or failure on sequencer delay cause the HV PS to blow fuses or arc. This also under the constraint of having to use one lead of 240v on the input to energize the supply to maintain compatibility with the L4B. 24V coils makes that much more complex. After looking at all the options, I think I will try Phil's approach. I plan to have the overall HV controlled by a 24v line on the controller that I can drive from the sequencer. And if this idea that Rick has looks good, I will have excellent overall control of the rig. I also have a mechanical interlock switch that will hopefully only blow the fuse if it is accidentally tripped. Since we are also talking about sequencing - I read the Fabio II thread. What would a good starting approach be? (Ignore my sequencing in the schematic) I have relays for HV, RF drive, PTT (mod and RF Deck keyed at the same time), and antenna. I have not made a provision for screen. I am thinking about separating the RF Deck and Mod PTT relay mainly because I don't want to run a line from the relay on the mod deck across to the RF deck (see schematic). thoughts? Should mod and RF deck be on separate sequences? This is great. I am following along on your project closely. I have wanted to build the K1JJ rig for several years but am still on the hunt for the last remaining piece - a dang modulation transformer. Yes, Rick's adjustable delay software sequencer will suit you fine. The sequencing timing you show above is a good starting point. I use a screen relay in my sequencer keying on the RF deck. Your mod tubes in triode config do not need screen keying IIRC. When you test you will see. My own 4-1000A modulators are tetrode config and do use a screen relay and regulated supply. I believe I made my TX key and mod key independent. Reread the Fabio sequencer thread on pages 6,7,8,9,10 to see what I went thru. There were a lot of changes and experiments before arriving at the best optimization! Once running, there may be small screen/grid/plate meter jumps on key up and unkey that will require some sequencer fine tuning. (assuming it's not caused by parasitics) I even changed the key up order at times. You will have to test and see. Bear in mind that some big rigs have no sequencing at all and get away with it FB. A sequencer is simply another step to making sure the rig operates smoothly and without surges, arcing, etc. I always use a sequencer for all big rigs here and gain full control of the rig. Another thing to consider adding is a 5K-7K 100W power resistor that gets switched across the modulation reactor during unkey to quench the arc and dissipate the magnetic field. It gets keyed open during transmit using a vacuum relay. This makes a big difference when it's time to unload the high power audio and protect the mod iron.. Normally the antenna takes the RF deck dumped energy without this kind of relay circuit, but the mod xfmr and mod reactor are not always able to dump it easily into the RF deck and may create spark gap arcs that can be excessive. During sequencer testing I seem to remember keeping the RF deck on for an instant while the modulator finished dumping its power. Anyway, you may and may not need these extra features, but now you know what to do if these problems come up. Think in terms of "where will the dropped power go and what currents will want to soar when I key and unkey?" "Will a different order and timing help solve these problems?" "What will happen if I turn the screen on without the HV?" "Is it best if the audio keys on last so that the whole modulator chain and RF deck have good loads?" "Will the RF deck screens stay in safe cutoff if the RF drive comes on before the HV?" These are good questions to learn from and get you thinking in the right direction. Welcome with your first post! Try and see. I'll bet you find some quickly. John had the same problem and found it in only a few days right here on this BB. Hi Tom. I am actually not new here. For some reason I was no longer able to log in with my old user name "stevef" so I didn't see any option but to create a new account. Anyhow - I will take your advice - Thanks! Still ironing out a few details. I was not happy with the mains switch setup. Now have a 3pdt relay with a start-stop no/nc switch. This will give me an auto power off if there is a power glitch. Parts still not all here so no progress on the actual build other than rough layout. Main item to fit just arrived on Monday, a Superior Powerstat. Going to have ability to vary HV from around 1500v on up. Watched the ARRL video of the Gates bringup with Tron. Noticed they were running the HV at 1800v. Was cool to recognize the same components that I have. Question on filaments. I have 2 separate transformers or I can use the dual 10v one from the Gates. Is it better to have the filaments trans close to the tubes it feeds or can I mount the dual one and feed the tubes with 2-3 foot leads? Filament transformer leads need be large enough to avoid voltage drop. Otherwise no issues with a remote transformer. I presume you will monitor filament voltages at the socket, so all should be well. Which MOSFET audio driver are planning to use? Yes, as Pat says, any length filament leads will do, but if they are too long you may not have enough tap or Variac range for the fil xfmr to cover the voltage drop. Just a waste of power since 813s take a fair amount of fil juice. Just be sure to well bypass the RF stage 813 with .01s at the fil pins... and also bypass the modulator tubes at the fils with both audio and RF bypass caps. I see no audio bypasses on the Tesla 300 schematic. I have run tests without audio bypass caps and did not see much difference in sweep performance, but would hate to think that the extreme highs were getting thru the iron without problems. If anything, bypass both stages well to enhance stability. Yes, you can use either separate fil transformers or dual windings. Once the RF or audio gets bypassed to ground, the stage doesn't care where the 10 VAC comes from. I've got that power supply in my shop. Knocked me with 6kv. How are you now BTW? I hope healed up well!! For low voltage high current filaments a good and very flexible wire is the stuff used by car stereo shops for high power amps. It's made of many fine wires like a welding cable (The #10 may have 500-1000 strands), instead of a few coarse ones like 'mains' wiring. It's cheap too. Just encouraging overkill..
Its insulation is usually silicone type and not as tough as the 600V stuff, but heat shrink tubing helps. The one that Tom used on Fabio II. Page created in 0.066 seconds with 18 queries.